3 - AVOID DISTRACTED DRIVING! Save the link to the video in your favourites folder on your browser for easy access. 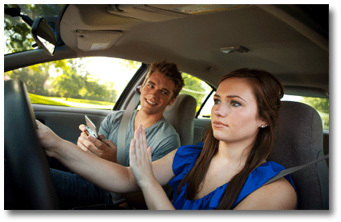 You are 23 times more likely to be involved in a crash if you are texting. What is the definition of a driving distraction? A diversion of attention from the driving task not related to impairment from alcohol, fatigue or medical condition. Diversion occurs because the driver is temporarily focusing on an object, task, event or person not related to the driving task. How many distractions can you identify? The biggest culprit currently is the mobile device. More people are using phones but for shorter periods. For United States legislation, click here. For Canadian legislation, click here. It doesn’t matter how good a driver you are, you cannot manage all of the tasks already associated with driving safely with added distraction. If you are unable to ignore your mobile device, turn it off or put it in the glove-box or trunk until you reach your destination. Then even if your initial good intentions are challenged, by a ringing phone or message alert, you will be unable to surrender to temptation. Don’t cheat or fool yourself that checking the texts while stopped at a red light is okay. Change your voicemail message to one noting that you may be driving and will return the call later. Plan to eat before leaving and set aside enough time. Take a break and walk into a fast food outlet instead of doing the drive thru. Program your GPS before leaving and use the voice directions so that you minimize screen time. Put on your makeup, shave and finish getting ready for work before you leave home, not on the way! Focus on the driving task and not related events, scenery or attractions. Plan to STAY FOCUSED on driving even when other distractions compete for your attention. How many more can you identify? What is your personal solution? Spencer McDonald discusses the importance of driving without distractions. For this week, turn off your mobile device as you get in the car and ensure that it remains off whenever you are on the road! Refrain from other distracting activities or observations. Download a pdf version, of this meeting planner, HERE!